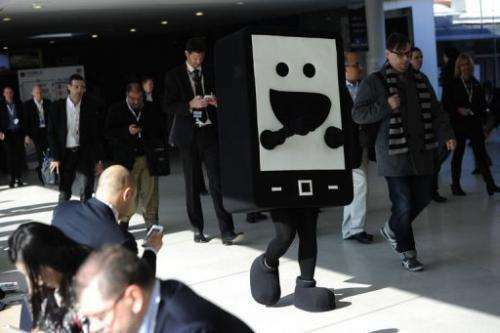 A hostess wearing a mobile phone costume walks at the 2013 Mobile World Congress in Barcelona on February 26, 2013. As smartphone giants Apple and Samsung battle for the wallets of tech-savvy youngsters, a growing number of manufacturers is trying to lure a fast-growing new market: their grandparents. As smartphone giants Apple and Samsung battle for the wallets of tech-savvy youngsters, a growing number of manufacturers is trying to lure a fast-growing new market: their grandparents. Handset makers at the world's biggest mobile fair in Barcelona, Spain, showed off a slew of new devices aimed at the hundreds of millions of older people put off by the complexity of the latest iPhones and Android-powered smartphones. One of the leaders of the segment in Europe, Austrian firm Emporia, launched a new handset, the Emporia Connect, at the February 24-28 Mobile World Congress. The sleek-looking black and silver flip phone is designed not to be "stigmatising" yet easy enough for older buyers to use, said Emporia's general manager for France, Christophe Yerolymos. It has a keypad with larger numbers and an emergency button that will send an SOS along with data pinpointing the location of the phone. The phone features a system called Emporia Me, with an array of remote control features for the owner's family, allowing a child or grandchild to check the device's location, battery status, or ensure the volume is up. While it is not a smartphone and has no mapping service, it does have an orientation feature that lets a user push a single button to get turn-by-turn audible instructions for returning to a car while on a shopping trip, for example. 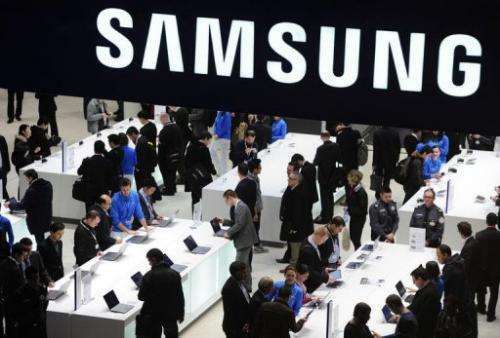 People visit a Samsung stand in Barcelona on February 26, 2013, on the second day of the 2013 Mobile World Congress. "Emporia is a company in growth, strong growth, even in the heart of the economic crisis we're in at the moment in Europe," said Yerolymos. Japan's Fujitsu rolled out a European version of a smart phone for seniors, the Stylistic S01, which first launched in mid-2012 in Japan where it lured buyers from a wider age range than the group anticipated, from 45 years upwards. It is an Android-based smartphone with large, simplified icons, and a "family alert" button that will send a message along with geo-localisation data. But it also has an unusual touch-screen that will only respond when the user presses a bit harder so as to avoid launching applications by mistake, said Fujitsu Europe-Middle East-Africa product marketing director James Maynard. "You can actually pre-touch and then when you know which button you want to press, you can exert a little bit more pressure," he said. "It's made to grow with you so as you become more confident you naturally will exert more pressure on to the device. It's a stepping stone from a feature phone to a smartphone and using a touch panel for the first time." Kapsys, a French firm, showed off its SmartConnect handset aimed at seniors. The firm is in discussions with operators including Orange and is hoping to launch the device for about 400 euros ($520) in Europe in June and then in the United States by the end of 2013, said chief executive Aram Hekimian. The SmartConnect boasts familiar features for the market: large icons, text in large characters, remote access for family members and also an SOS button with geo-localisation. But it also incorporates a digital magnifier, enabling the user to roll the phone over text to facilitate reading, for example. The phone is rich in voice command functions, too, allowing the user to avoid fiddly buttons. "Seniors today are used to having access to technology. As they get older they will want access to the same functions, the same technologies," Hekimian said. Kapsys estimated the potential market for the telephone at 600 million people, he said. "Our goal is to capture one percent of that market by 2015." A two-stage touch screen would be welcome. My wife's phone drives me crazy, it is so sensitive. You don't say.. Is it only the wife's phone, which drives you so? My Mom will be 80 next week, I know that she would welcome a phone that she could use more comfortably, then she wouldn't have to always ask me to look things up or just use the internet easily when she wants to.